Christmas holiday in the Abbott household always seems to run until our son, Dougal’s birthday on 13th January, so now we are slowly returning to our normal routine. Over the 30 years of my career, the central part of my business has been devoted to running green wood courses through the summer based in a workshop in the woods. During the winters, if I haven’t been distracted by writing books or by moving home, I would occasionally make some chairs to order. Over the first 12-15 years I must have made about three dozen double-bow Windsor chairs but I am now unable to find any detailed records of who purchased them all. Here’s a pair from a batch of three that I made last year, having not made any for about fifteen years. I was reluctantly persuaded to make one for an old customer, so I decided to produce a set of three, making use of a beautiful old elm plank that had been lying at the back of my workshop for the last ten years or so. During this process, I realised why I had stopped making Windsor’s in favour of the simpler (and to my mind, more comfortable) lath-backs. Last winter, thinking that I was soon to give up running courses, I embarked on making a series of lath-back chairs – a design that has steadily evolved over the last ten years at Brookhouse Wood. To assist with my records, I decided to give each new chair a number as well as the ‘M ABBOTT’ name stamp and to document each one in a special ‘Chair book’. Last year’s chairs are 1-4 and the elephant’s eye, settin chair that I made in November is number 5 . The 6 chairs that I was busy with throughout December are numbers 6 to 11 but for some reason, I completed number 11 first and that was collected before Christmas. The deadline for the set of five was not till into January, so I waited to seat them until my daughter, Nettie came home on holiday from university to lend an extra pair of hands. She is studying Maths & Philosophy, which I reckon makes her well qualified to work on interesting chair-seating patterns. Apart from a few minor details, (hopefully the subject of another blog for the chair-making nerds amongst you) I am now pretty happy with the chair structure but the seat pattern is still developing, so after each one was finished, we’d work out a variation for the next one. These chairs had been commissioned by Ian, who had come from Australia to attend a course last May. Being unable to take the chair home with him, he gave it to his sister-in-law Hazel, who then said she’d like a full set. In early January, Hazel arrived with her sister and with Phil, who had a big car to carry the chairs. 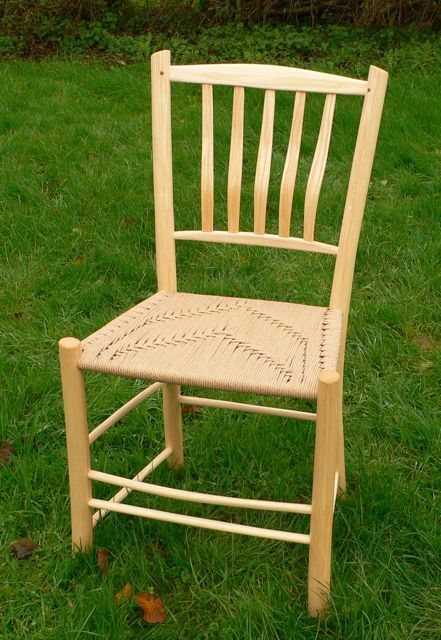 I’ll now print off the pictures of my first dozen or so lath-back chairs and paste them into my new chair book. I also intend to copy this information into a ‘Chair’ page on my new website – but all in good time! I’m still waiting for Peter, my assistant from last summer to confirm an order for about 40 chairs for a theraputic centre in Denmark, which we plan to work on along with a colleague called Ben. In the meantime I have agreed to place some chairs in an exhibition in September (2016) at Twenty Twenty Gallery in Much Wenclock in Shropshire. So it looks as if I shall at last become a chair-maker to keep me busy when not running courses in the garden at home.